As makers we know there is nothing better than sharing something we created with others. It might be freshly baked, handcrafted, or better yet sewn! Whether it is for a birthday, special occasion or a holiday present, something you create yourself always makes the best gift and one the receiver is sure to treasure! Headed into this year’s holiday season we picked our five favorite indie patterns to sew and give. We chose these patterns based on their style, simplicity and versatility. Not only are they quick to sew, they don’t require a lot of material and are easy to customize to suite the recipient! Things to keep in mind when sewing for others. Size and Fit—You likely don’t have the exact measurements of the person you are sewing for, and that isn’t exactly something your can just get without spoiling the surprise! The best advice is to pick a pattern or project that is rather forgiving—not too fitted or has some stretch giving you some margin for error. Sticking to patterns you have sewn for yourself also helps and gives you some insight on any changes you potentially might make. If you are sewing for someone, you probably know them well enough to know whether you should lengthen the hem inch or two, include a FBA, etc. Style–Simple is always better! We have all received a store bought piece of clothing that we will never wear. You never want that to happen to something you took the time to make, right! Pick a garment that is simple, classic and that will fit easily into any wardrobe. Fabric—Have some fun with your fabric choice! Keep things super simple with a solid color. Choose the recipient’s favorite color or one you know they look amazing in. Or if prints are more their thing, pick something totally unique but versatile enough that it could be worn with a variety of different things. Versatility is key! Time—If you can batch sew! Sewing multiple versions of the same pattern saves lots of time in assembly. Complete the same step for all of your projects before moving on to the next one, just be sure to label the pieces somehow if you are also using the same fabric! Save even more time by finding a neutral thread that works for everything. 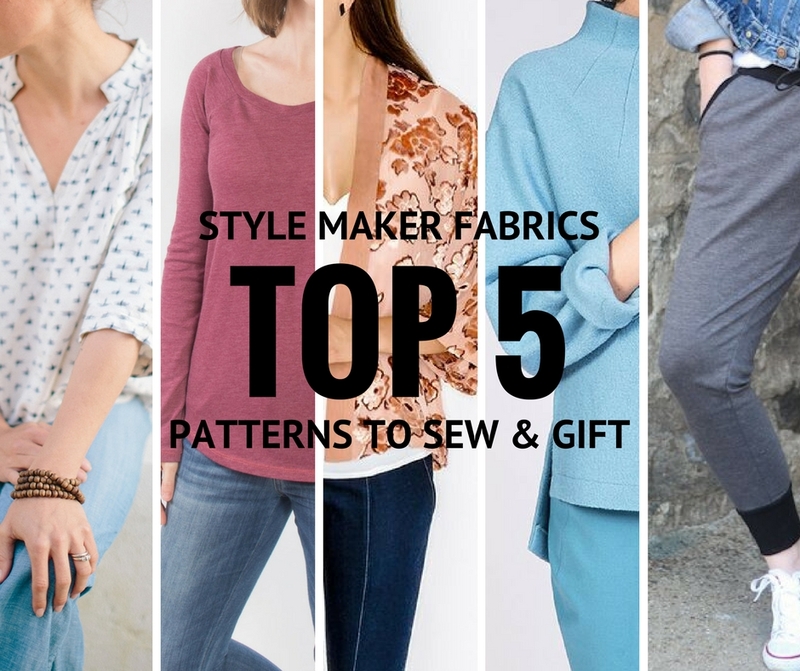 Now, let’s jump into the fun part—our Top 5 patterns to sew and give based on some of the parameters we mentioned. You will find an assortment of garments, styles and fabric types to hopefully accommodate a whole range of possible recipients. Also watch for other pattern and fabric recommendations along the way! 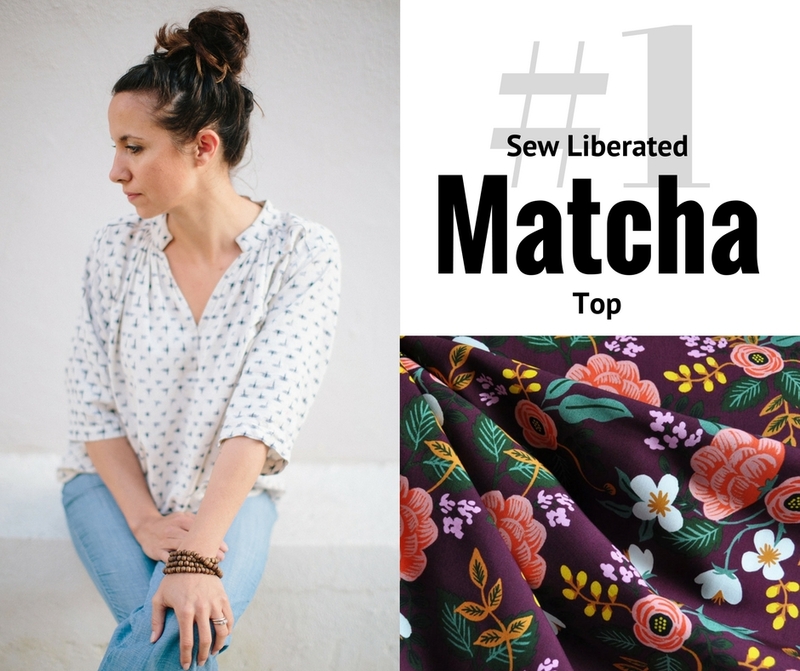 Pick #1—Matcha Top from Sew Liberated. This loose fitting blouse is simple and chic with a touch of modern flare. It can easily be dressed up or down for any situation making it a great choice for both style and versatility. We particularly love the Japanese inspired neckline—something more unique the probably isn’t already in your loved one’s closet! For fabric choices, we paired it with one of the Rifle Paper Co rayon florals—feminine but simple at the same time—but this pattern works well with rayons, linen, chambray and just about any other woven. We love the drape of rayon and put that at the top of our list! Close, but not quite right? Check out True Bias’ Roscoe Blouse. A bit more feminine with the same versatility and ease! 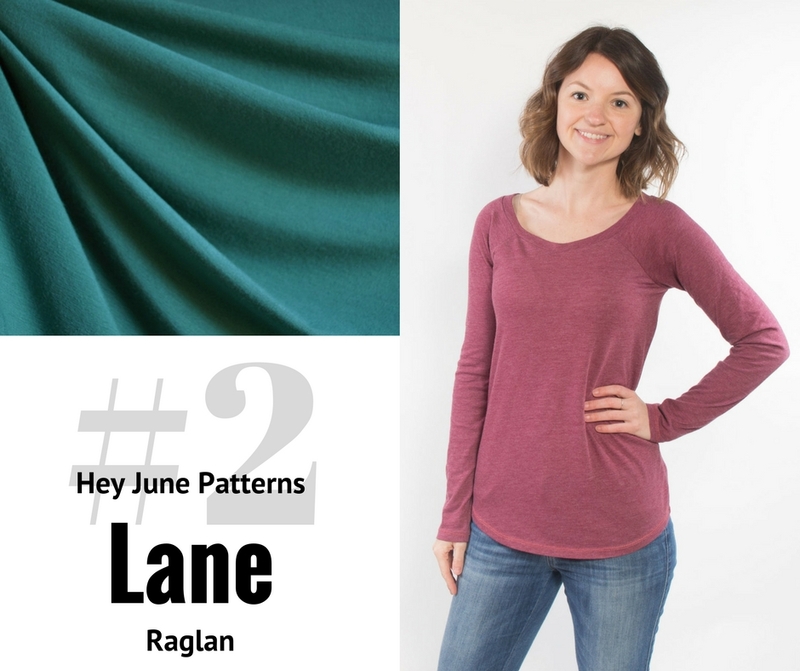 Pick #2—Lane Raglan from Hey June Patterns. A wardrobe staple that you can never have too many of and that never goes out of style. This pattern is the epitome of versatility and should be in every seamstress’ pattern arsenal! With so many options (hemline, neckline, sleeve, oh my) included right in the pattern, you can create a totally different top for everyone on your list. While it is simple, it is one that is sure to be well worn and loved! Fabric choices for this top couldn’t be easier—KNITS! We paired it with a modal jersey knit but you could easily go with any jersey, French terry or even a cozy sweatshirt fleece. Try solids, stripes, prints or even mix-and-match. The raglan style makes this a great top to try different color/pattern combination for the body and sleeves. For sizing, the more stretch the better, creating more ease and forgiveness. 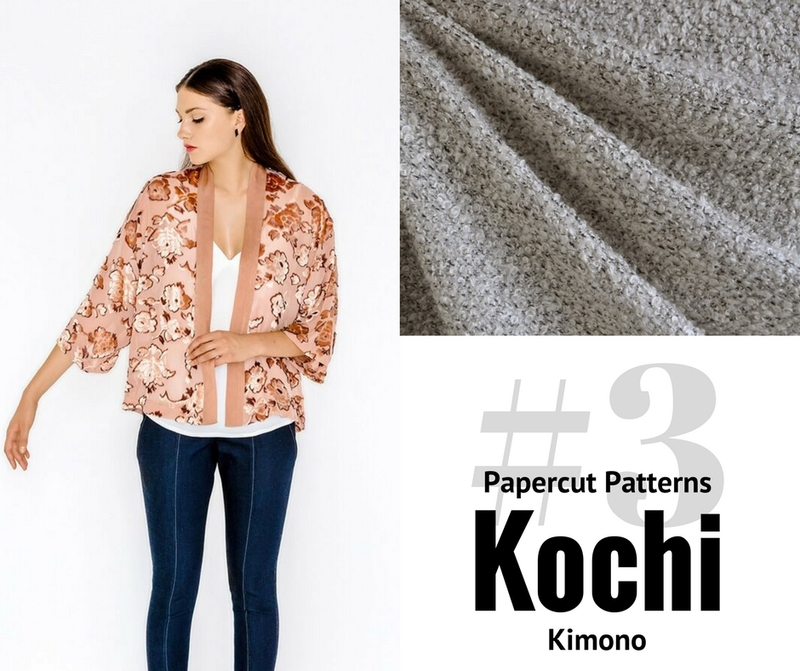 Pick #3—Kochi Kimono from Papercut Patterns. Probably our “trendiest” pick, there can’t seem to be enough kimonos in RTW fashion right now and we can see why! Simple and versatile, you can pair them with just about anything, especially your favorite jeans. Our favorite part of about this pattern is the range of fabric options! Keep things simple with a drapey rayon or kick things up a notch with velvet. For the cooler months, try a cozy sweater knit like the boucle knit we included above. The possibilities are endless and totally work for this style top! 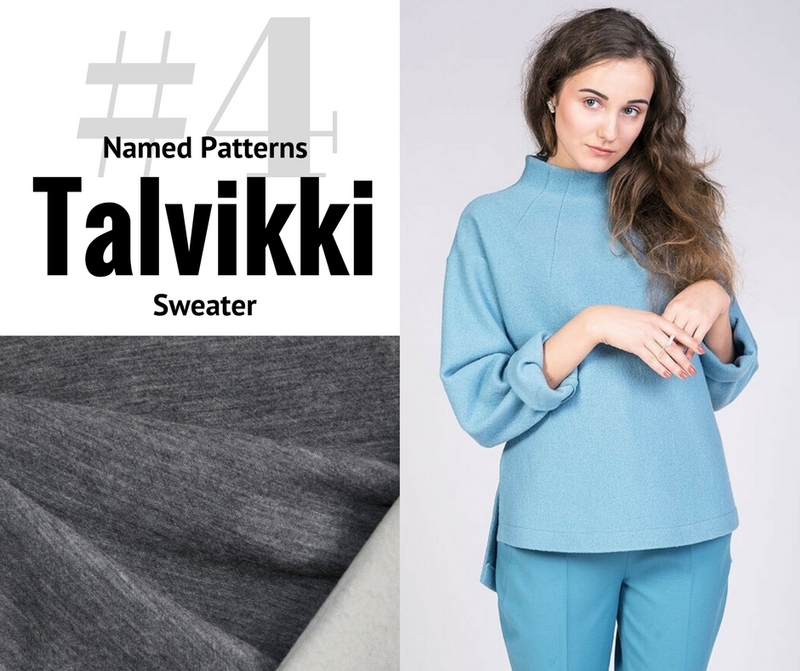 Pick #4—Talvikki Sweater from Named Patterns. By far, this is one of our favorite pieces in our own handmade wardrobe. Such a simple pullover but the neck detail and split hem help elevate it into something so much more! A great choice for just about anyone, especially during the cooler months. Choose a cozy sweatshirt fleece, French terry or even a plush sweater knit to make this wardrobe staple a new favorite! Close, but want more simplicity? Try Grainline Studio’s Linden Sweatshirt or Sew House Seven’s Toaster Sweater. Both great options with a simple, classic style! 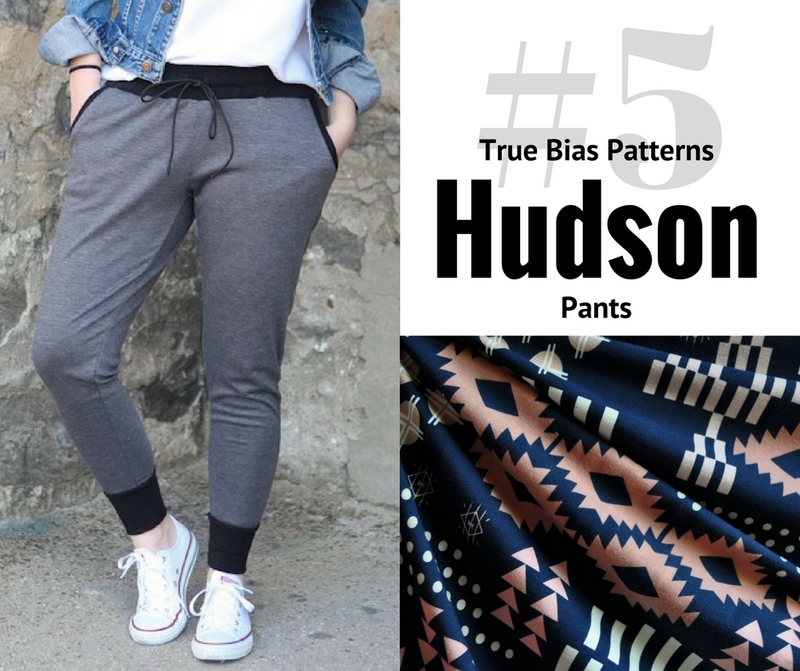 Pick #5—Hudson Pants from True Bias Patterns. For our one pants pattern to make the Top 5, we picked a personal favorite to sew for gifts. Comfortable and casual, these classic knit joggers make for perfect loungewear or even pajamas! Picking out the right fabric for this pattern will be difficult…there are just too many choices! For the actual fabric type, jersey knits, French terry or sweatshirt fleece are probably the best options. As for color, if you want to keep things simple stick to the classics—grey, black or navy. For a bit more fun and personality go bold with prints and colors, especially if you are sewing them up with pajamas in mind. Butterflies, florals, Eiffel Towers, you name it! You might even want to consider making it a set and sewing up a Lane Raglan (Pick #2) to match! Thinking pajamas? One of our other favorite patterns in Closet Case’s Carolyn Pajamas. The pattern doesn’t call for knit but we highly recommend it. And even if you only have time to sew the bottom, they will make the perfect gift! Hopefully you found this Top 5 helpful and that you are inspired to sew for some of your friends and family. The task might seem a bit daunting, but there is no better gift than one made with love! And they are sure to love whatever you make!